We spent a week in this fantastic apartment and enjoyed every minute of it. The apartment is in a spectacular location with an unbelievable view of the coastline. The apartment was very spacious, airy and clean and fitted the description on the website accurately. It was very well located for the beach, the old town and the harbour. Elisabeth, Pierre and Sandrine were incredibly helpful and welcoming. We hope to visit again soon - thank you. The apartment faces the sea directly with the old port of Cannes to the left, the mountains of the Esterel to the right, and the lovely islands of Lérins in front of you. Cleverly placed mirrors magnify the gorgeous sea view. The living-room/dining-room area is spacious and so comfortable that with the continuous presence of the sea through windows and mirrors we get the floating feeling of being in the stateroom of a luxurious cruise ship. The well-equipped kitchen makes you want to unleash your culinary skills. The famous covered market is just down the street, and the Neapolitan Rue Ménadier with all of its delicious food shops just beyond the market. Not only is the apartment central to the food markets, traiteurs and bakeries, it is also just a short walk from the great clothes shopping streets of Cannes, from the bargains on the Rue Ménardier, the trendy boutiques of the rue d'Antibes or designer stores on the Croisette. When you step out of the apartment you go directly to the sea through a little passage and across the street is the beach and its restaurants, or you can turn to the left and walk by the old port, with its own coterie of restaurants, and then you are in sight of the Palais des Congrès of festival fame, and the world famous Croisette whose whole landscape changes as the day unfolds, from locals on their bicycles with their baguette and newspaper (and dog) always ready for a chat, to children and edgy youth on rollerblades, the elderly well-dressed, tourists clicking away at selfies. As we attended several performances at the Palais des Congrès, we marvelled at being able to walk, sharing balmy evenings on the sidewalks and cafes with other strollers in a real resort relaxed atmosphere. Getting breakfast downstairs at one of the restaurants or going for a quick delicious lunch when we didn't want to cook was also a great convenience. We took pictures throughout the day: the sea changes color, the clouds move, the colors range from navy blue to turquoise, the cruise ships come and go, the sailboat school flotillas with hapless beginners offer endless entertainment, the golden light of the morning shifts into burnished tones in the evening. It is an endless spectacle. 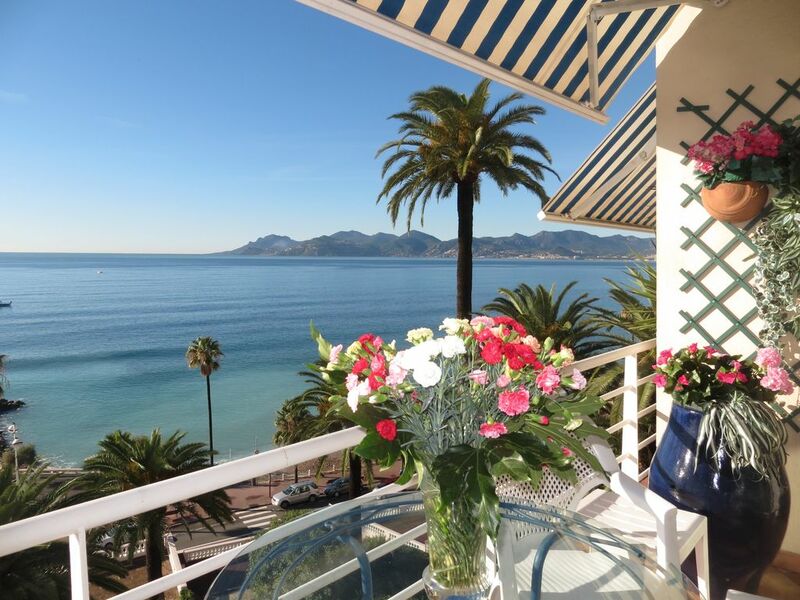 This apartment is a gem, perfect for an entry into the world of Cannes or a repeat visit. We have been coming to Cannes for many years and this is the best apartment we have rented. Mr and Mme Giry were perfect hosts, very caring about the quality of our stay. The apartment was lovely. The view was spectacular. Beds were very comfortable and kitchen was well equipped and appointed. The location is a short walk to food, water and entertainment or a short drive the many sites close by. We had a great week and hope we have the chance to return again soon. Wonderful apartment by the sea. We've stayed here several times now and we love it. It's a beautiful very comfortable apartment with excellent amenities. The owners Elisabeth and Pierre are lovely people and do everything they possibly can to make your stay comfortable. Nothing is too much trouble for them. The view is fantastic and you wake up each morning to the sound of the sea. It's a very short walk to the lovely beach and a pleasant 10 minute walk to the centre. There are lots of very nice restaurants close by. Can't wait to go again. Thanks again to the owners. It feels like home from home. The apartment was really fantastic. It was a ten minute walk from the Palais and across the street from a beach. The air and wifi worked great and the view is amazing. Just a great experience and the hosts even helped us arrange a driver to and from the Nice airport which was super helpful. Highly recommended. Wonderful apartment, close to all amenities, shops, buses, boats and beach. This is a very well equipped apartment with beautiful sea views. Thoroughly good holiday with my 80 year old mother as everything so close. Mr and Mrs Giry were very helpful and promptly replied to any questions I had. Would definitely go back. 200€ pour l' accueil, draps, serviettes & ménage de sortie, en plus du tarif de la location. 200€/booking for welcome by housekeeper,linen, towels & departure cleaning.